If there’s one thing this Ginger Book Geek likes, it’s discovering new authors and Erik Therme is certainly a new author to me. I couldn’t wait to start reading and so without further ado, I jumped straight in. 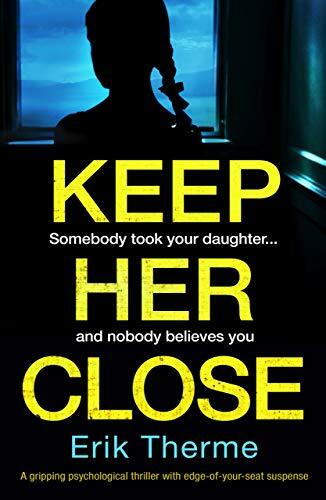 I was not to be disappointed as I thoroughly enjoyed ‘Keep Her Close’ but more about that in a bit. I couldn’t help but feel for Ally right from the very start of the book and I ended up feeling very protective of her. When the story opens a very young Ally is on her own in a car park with a note saying that she is free to a good home. If I could have swooped in to take her to a safe place then I would have. She could have been picked up by one of the many predators out there. It emerges that a close female relative has fallen to her death. nearby. Fortunately a kind hearted couple come across Ally and ensure that she is safe before notifying the authorities. A few years later we meet Ally again, who has been adopted by the kind hearted couple, who found her all those years ago. Ally is now an adult but she still has lots of unanswered questions about her background and it isn’t surprising that when somebody claiming to be her birth father gets in touch and wants to build a relationship with her much to her adoptive parents’ disgust. I could certainly understand why she was so eager to meet this man but at the same time I think that she was jumping in with both feet without making the necessary checks to either verify his claims or to disprove them. She could have been walking into anything. Ally is kind, generous, perhaps a bit too trusting, friendly, supportive, considerate and compassionate. She is certainly someone I wouldn’t mind having as a friend. I have to admit that I was a bit unsure about the motives of the man claiming to be her birth father but at the same time I couldn’t help but hope that she had found her birth father and that she would finally get the answers she needs about her background. I was keeping everything crossed for her that she got the happy ending that she so deserved. Does she? Well you are going to have to read the book for yourselves to find out as I am not going to tell you. ‘Keep Her Close’ is very well written and easy to get into. The author has a writing style that is easy to get to grips with and to enjoy. The Prologue begins in such an upsetting way that will ensure this book stays fresh in my memory for a long time to come. From that moment onwards ‘Keep Her Close’ became an addiction for me. I found the book to be unputdownable and I read it in one go. I was gripped by the storylines and I was so ‘into’ the book that I began to ‘live’ the story and I found myself interacting with the book. I just couldn’t bear to be parted from the book without first knowing if Ally was safe and whether the man claiming to be her birth father was who he said he was. The deeper I got into the story, the quicker the pages seemed to be turning as I raced towards the end. I had mixed feelings about finishing the book. Don’t get me wrong I was pleased to finish because at least I knew how the story ended but I wasn’t pleased to finish because I was enjoying the author’s writing style, the storylines and the characters so much that I just wanted the book to continue. Reading ‘Keep Her Close’ was much like being on an occasionally scary and very unpredictable rollercoaster ride with more twists and turns that I care to mention. I smugly thought that I had worked out the details of what had happened, to whom and why only to realise that I had the wrong end of the stick altogether and the solution was something else entirely. The plot of this book certainly kept me on my toes and kept me guessing all the way through. In short I thoroughly enjoyed reading ‘Keep Her Close’ and I would definitely recommend it to other readers. I can’t wait to read what Erik comes up with next. The score on the Ginger Book Geek board is a very well deserved 5* out of 5*.